Hale Appleman is an American actor. He is best known for playing Tobey Cobb in the 2007 film Teeth and Eliot in TV fantasy series The Magicians. Appleman’s credits on stage include the revival of Streamers at the Roundabout Theater Company, Clifford Odets’ Paradise Lost at the American Repertory Theater, and the New York premiere of Sarah Ruhl’s Passion Play as Jesus. In 2011, he played Bob in Moonchildren at the Berkshire Theatre Festival, and can be heard on the L.A. Theatre Works recording of Sam Shepard’s Buried Child. Appleman was seen at The Old Globe Theater as Mercutio in The Last Goodbye. Appleman played Zach on the NBC dramatic series Smash. He made his film debut in Beautiful Ohio and portrayed cartoonist Judd Winick in Pedro. 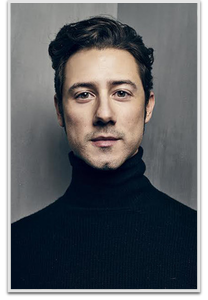 His other credits include Mercutio in Private Romeo, the short film Oysters Rockefeller, and he currently plays the magician Eliot in The Magicians, a TV series based on the novel of the same name by Lev Grossman.